Back in November 2009 Buxton Museum and Art Gallery successfully bid on an Ashford Black Marble plinth at Tennants Auction House in Leyburn, Yorkshire. We were interested in this piece as we have nothing like it within our collection. It is however a bit of a mystery and we are trying to find out more information about it. On one side there is a silhouette of a man and on the opposite side there is a shield, the other two sides are decorated with flowers. We have an inking that it may have come from a school, college or university, maybe it was the base for a school cup? The shield has a white cross, a scallop shell and an outreaching arm holding a scroll with the writing ‘Deo Pacet’ on it. Does anyone have any ideas of its origin? Can anyone point us in the right direction? not much help – except the scallop shell is an image used in the Methodist church? Hello Ann, Thanks for the pointer. I will investigate a Methodist link. My latin doesn’t stretch very far but even with the help of Google I am flummoxed by ‘Deo Pacet’…..
Just had a thought about this. 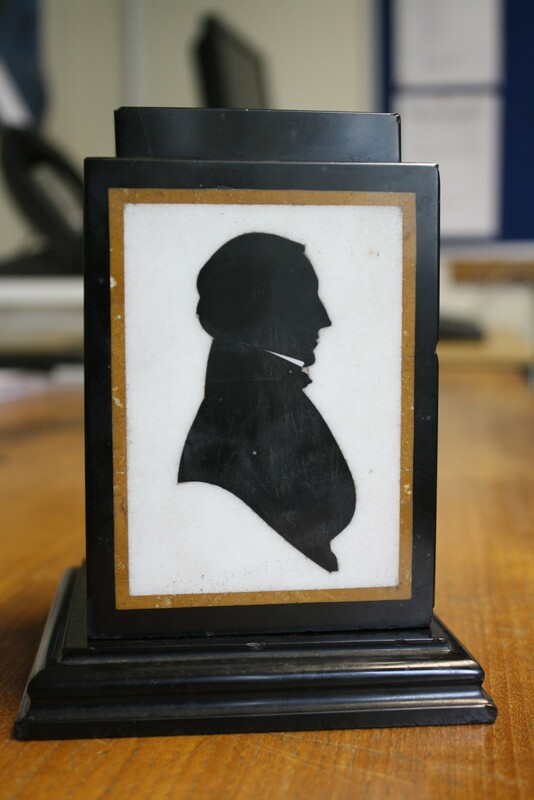 White Watson produced a number of really good silhouettes of his friends and other local people. Derby museum has a collection of these so it might be worth looking there to see if it can be matched up with one of the ones with known identies. Could easily have been something that he used in his workshop as an example of the different types of work that he produced. I don’t know if it helps but the latin means something like ‘he is peaceful for / with god’, I think. 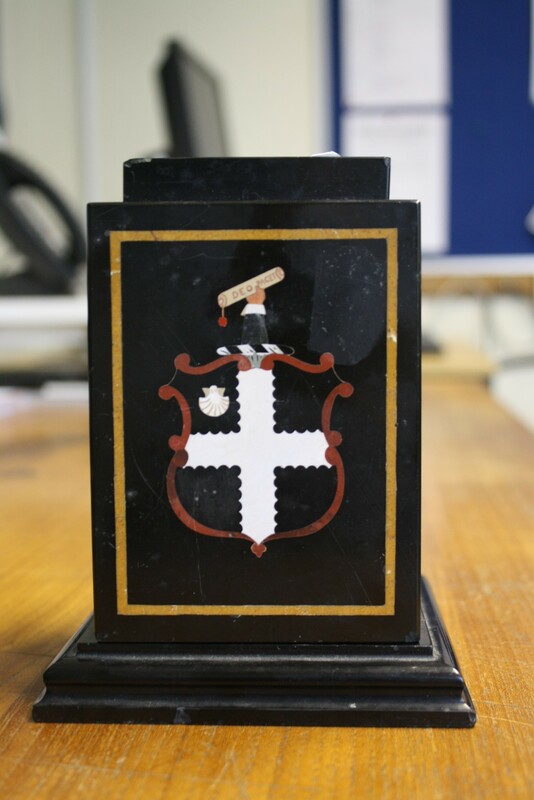 The plinth is a personal one, as revealed by the armorial bearings: sable a cross engrailed and in dexter chief an escallop argent; crest: a cubit arm erect, habited sable cuffed argent grasping an escroll thereon the motto: Deo Pagit [sic]. These are the arms of Paget (hence the canting motto) of Chipping Norton, Bolehall, Tamworth Staffs., The Sneyd, Worcs. and Hoon in Derbyshire. The portrait will be of Revd. Canon Thomas Paget of Hoon Haye and The Sneyd (1812-1893) who was Chaplain to the Archbiship of York (the Markham one, hence the appoinmtment) for whom the plinth as made . He left four married daughters, and all were from Yorks. and NE families, hence the plinth ending up at Leyburn, no doubt. Normally black marble plinths of this type support a tazza. It is hardly an Enlightenment object, as this sort of inlay was not practised until the third decade of the 19thcentury, and the Pagets were country squarsons with no known contact with the Lunar Society or their ambit. By the way, the motto means “He covenants with God”, pagit being the canting element for Paget. Thank you Maxswell for this information. I will look into the Paget family and in particular Rev. Canon Thomas Paget. Having a name for the silhouette is fantastic. Our main interest in this piece was the decoration. We have a large collection of Ashford Black Marble at Buxton Museum, but none of our pieces have armorial bearings or silhouettes. By purchasing it, it gives us an example of a different way of working with ABM. – a distinctly Derbyshire product. Thank you for your help. I will circulate it to my colleagues involved in the project. Pingback: Paget Family – Ashford Black Marble Socle « Enlightenment!